When you’re taking impromptu photographs outside of a studio setting, it is close to impossible to fully control all the elements in the composition. Odds are there will be several unwanted objects that end up in your shot, and people may possibly inadvertently wander into the frame as well. As much as all that is unavoidable, the good news is that you can do something about it – if you want. 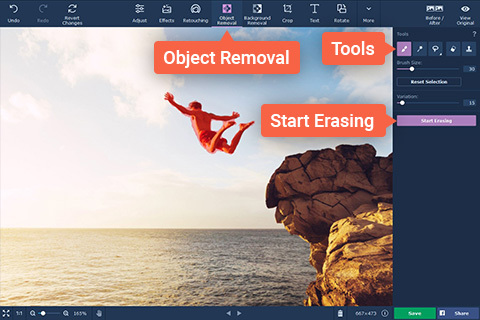 By using Movavi Photo Editor you will be able to remove people, objects and any other unwanted elements from your photos, and the best part is that it will be relatively easy for you to do so. To get started, launch Movavi Photo Editor and click on the ‘Browse for Images’ button so that you can select and load the photo that you wish to edit. It is possible to drag and drop it into the main window as that will open up the photo as well. All the tools that you need to remove people and objects are located in the ‘Object Removal’ menu, which you can access from the top panel. Once you click on it, a sidebar will open and you can then click on the ‘Selection Brush’ tool and use it to paint over the element that you want to remove. Ideally you should try to select the element as precisely as possible – which is why if the ‘Selection Brush’ doesn’t seem to cut it you could try the ‘Magic Wand’ or ‘Lasso’ instead. The ‘Selection Eraser’ can be used to erase marks that you don’t want, and refine the selection further. When you’re satisfied you can then click the ‘Start Erasing’ button and Movavi Photo Editor will remove the element that you selected. In some cases there may be a few imperfections that remain after the element has been removed, and if that is the case you should try using Movavi Photo Editor’s ‘Stamp’ tool to clean it up. All that entails is copying a similar part of the photo from elsewhere and stamping it over the affected area. Aside from removing unwanted elements, Movavi Photo Editor will let you replace the background, enhance the image quality, apply artistic filters, transform the frame and orientation, insert captions, and much more. It even has a diverse set of tools to touch up portraits or apply digital makeup that you may want to take advantage of as well. By following the instructions above you should be able to easily remove person from photo with Movavi Photo Editor. That in itself will give you control over the composition of your photos, and allow you to ensure they look great.